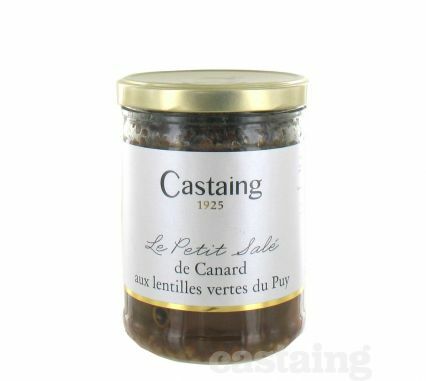 Like all the Castaing range, delicious! Tender pieces of duck cooked in a Puy lentil sauce. Makes a special French meal for two and simply requires warming gently in a saucepan. Green Puy lentils, duck, water, carrots, duck gizzard confit, pork breast, onions, starch, natural flavouring (contains gluten), salt, garlic, poultry stock, caramel colour, sugar.